FS-plugin for Total Commander. Intended for viewing and editing environment variables of current process (TC), current user and system. - Fixed bug which makes editing impossible if a variable has a long value (such as PATH). 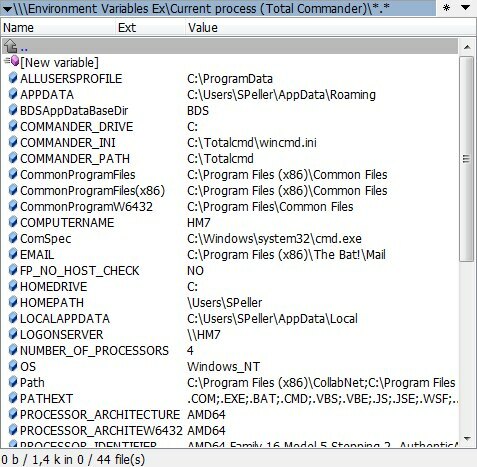 - Environment Variables Ex is entirely unicode and exists in x64. - Added support of file operations on variables like on usual files: copy in and out of plugin, move, rename. Files putted into plugin can be in ANSI or Unicode encoding. - Added custom columns support to show variables values in separate column without modifications. - Added elevation dialog to change system variables. Please, leave your comments, suggestions and bug reports in the plugin discussion page.